You can take the girls out the south, but you can’t take the south out the girls! 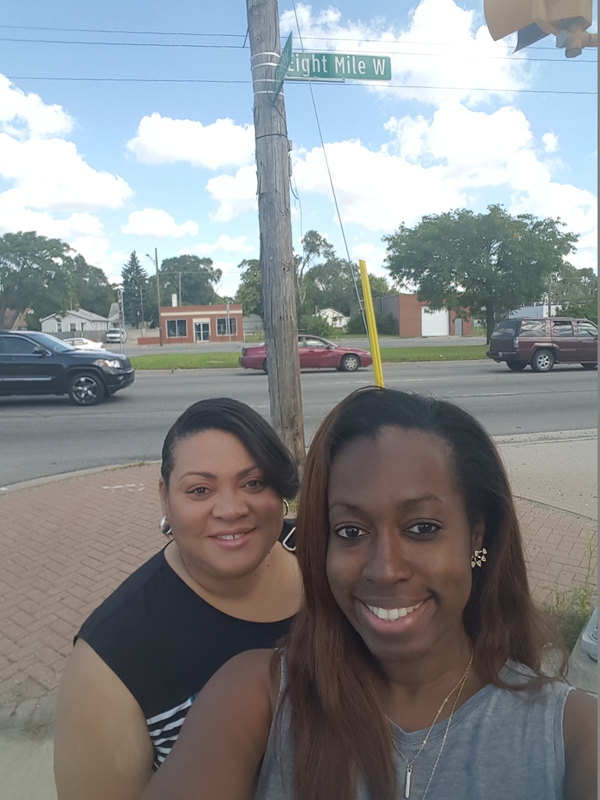 During our trip to Detroit, we decided that Sunday was officially “soul food Sunday” and we had to find the perfect restaurant for two southern girls who know good soul food. 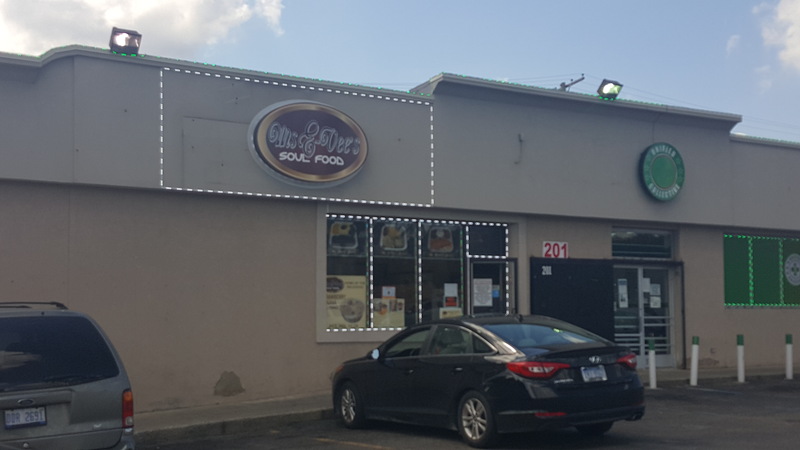 So we took to the internet to see what was out there and yes, there are quite a few restaurants in Detroit that specialize in soul food. We then went to our trusted friend, Yelp, and sure enough those reviews and photos helped narrow down our list of possibilities. 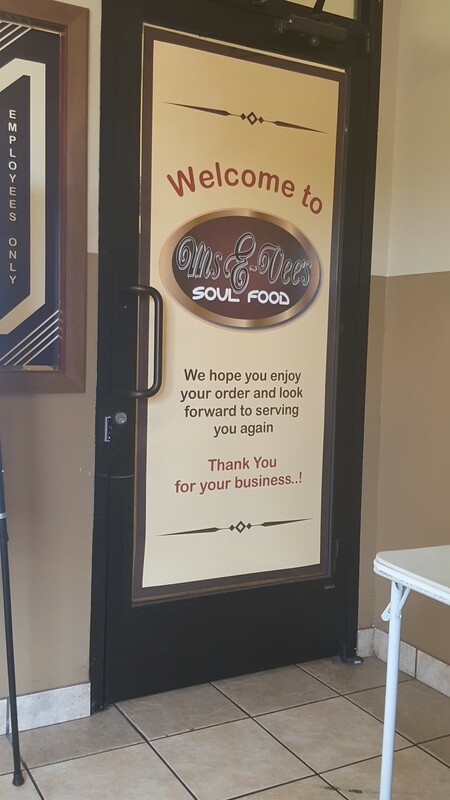 After reading several glowing reviews, we selected Ms. E-Vee’s Soul Food. Now in the review we read that the restaurant didn’t offer dine-in, only to-go, but we figured it would be worth it if the food was half as good as everyone said. We also noted that the restaurant is in the heart of famed 8 Mile Road, the northern border to Detroit separating the urban inner-city from the upper class burbs to the north. If you’re our age, we can bet you’ve seen Eminem’s movie, 8 Mile. It was a semi-autobiographical look at his life growing up in a trailer park near 8 Mile Road. So of course this came to mind! But we’re 2 Girls Who Travel and we are vigilant, travel-savvy women who refuse to miss out on a good Sunday meal. So we called Uber, our go-to method of transportation now, and headed to 8 Mile. Our driver was a cool guy who gave us a brief history of the area. We arrived at Ms. E-Vee’s just a few minutes after opening and the aroma of home-cooked goodness met us at the door. We had already scoped out the menu before we left the hotel and knew what we wanted. We walked right up to the bulletproof glass counter and placed our order. 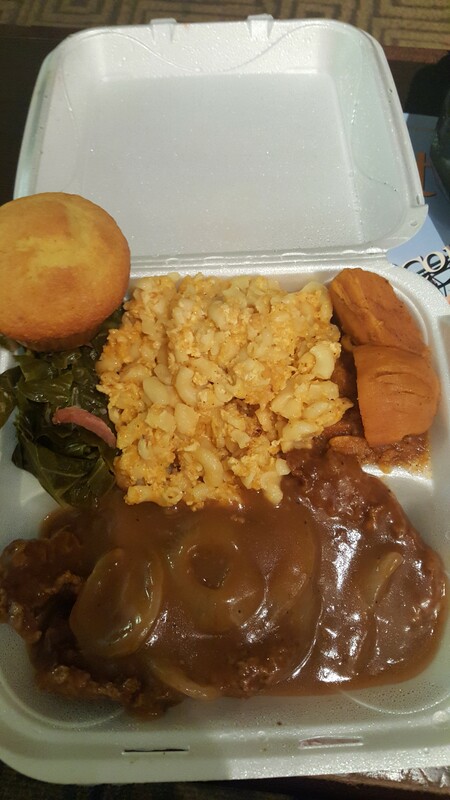 Val opted for two smothered pork chops, mac and cheese, greens and yams or as it’s called on the menu, “Ms. Ruby’s Special.” Kim decided to try “Mr. Robert’s Special,” which has four pieces of fried chicken, greens, mac and cheese and yams, plus she added a side of cornbread dressing and cranberry sauce. Now Ms. E-Vee’s slogan is “Fast Food Ain’t Good and Good Food Ain’t Fast!” That said, our order would take about 15 to 20 minutes. No worries, we needed to grab a few photos anyway. Guests sit in the waiting area and when their number is called they put your food in the carousel and send it out. We checked our order before we left and everything looked and smelled fantastic. Now back to the hotel to chow down. We called Uber and a car was there in minutes ready to take us back. Once back at the hotel, we immediately sat down to eat and after that first bite we knew we made the right choice. Both the fried chicken and smothered pork chops were seasoned perfectly. The chicken breast, thigh, wing and leg were all juicy and flavorful. The greens were good too – Val wanted a little more salt. The yams were just the right level of sweetness and delicious and the mac and cheese was tasty – not the best we’ve had, but we’d order it again. Kim enjoyed the cornbread dressing with gravy. It had the right spice blend and was moist. Some restaurants’ cornbread dressing can be a little dry. 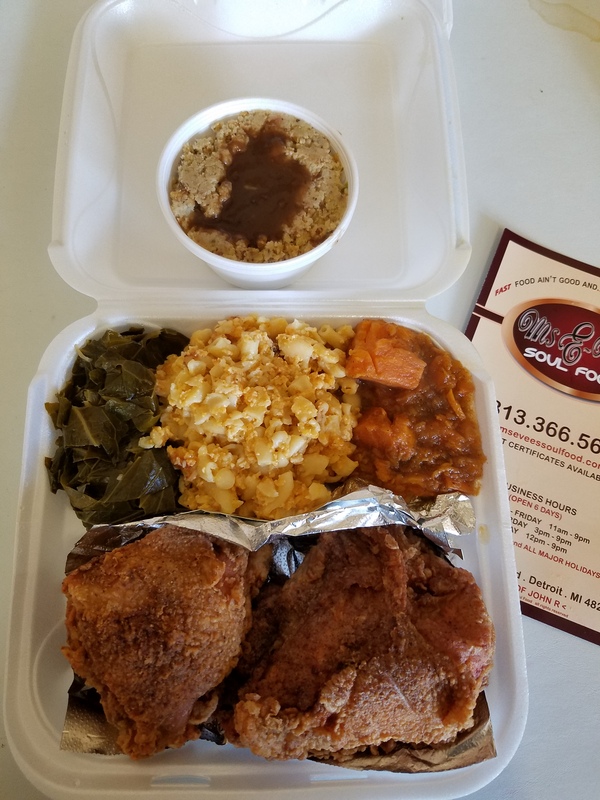 Our overall review: Ms. E-Vee’s does soul food right! The food was delicious and well worth the trip to 8 Mile. Plus the prices (Val – $15 and Kim – $18) weren’t bad at all considering the hearty amount of food we received! We give Ms. E-Vee’s the 2 Girls Who Travel seal of approval. If you want great soul food in Detroit, you have to visit Ms. E-Vee’s!